My variant of Burnhorn, designed to be utility knife of aggro, control and combo. It functions on explosive pre-T6 blitzes that require sligh mana usage on a low curve, with the ability to easily transition its shell to adapt to the opponent. The deck blends 3 archetypes to give it blinding gatecrash, incredible catch, and particularly consistency due to the large strategic overlap on it’s cards’ mechanics. It is in one breath both pretty easy to pilot but requires sly planning, positioning, and balance of strategy to elicit it’s real strengths against a range of other decks. Ultimately, the adaptability, raw strength, and deceptively intricate play is what gives this deck it’s appeal and versatility. Aggro aspect of the deck. More vertical than horizontal, using strong minions with huge burst potential at the cost of life, and minions that benefit from your general taking damage. You usually want to start every game with a blitz: even putting your opponent (and yourself) down to 15-18 by T2 allows for big blowouts from Fang or Spikes by T3/T4. Your minions are exceptional at controlling the board as well (often being able to trade up) but are weak to removal and dispel. However, the more you overwhelm your opponent with must-answer threats while chunking their life, the closer you get to closing out with Twin Fang or Decimus. 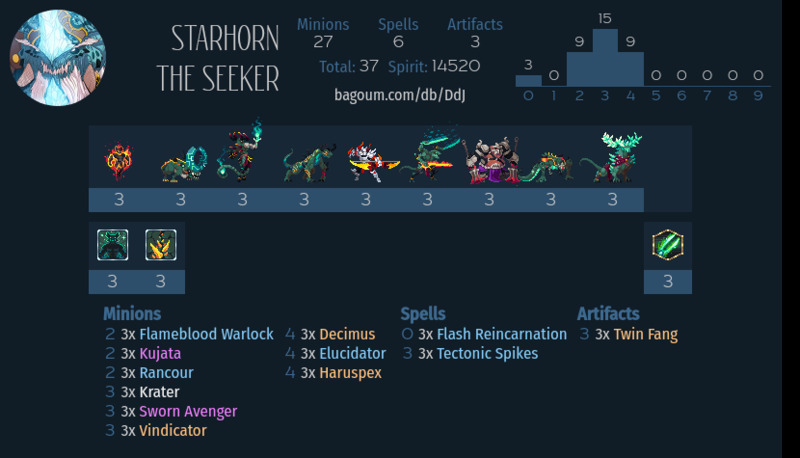 The bigger combo aspect of this deck revolves around Twin Fang and Krater/Skorn. You don’t need to OTK with it, hitting for 10+ is usually enough considering the amount of reach this deck has. However, you need to lean on the OTK against heavy healing decks like Healyonar, especially Aggro Ziran. You usually don’t want to pass the turn with it equipped, so use it like Blood Rage. Fang/Krater benefits from a wide board, and remember that Flash and Kujata triggers will both proc Fang. This is the tried and true Burn finisher. Flash Decimus Spikes on 5 is usually enough to put people in a panic on its own, although this is best saved for the kill. It’s hard to interact with, and can drill people down after midgame fatigue and removal has become scarce. The damage and the card draw particularly compliment early, wide pressure and T3-4 near-OTKs to refill your hand. When your opponent plays defensively, either by running away or removing your minions, Twin Fang gets weaker but Decispikes get stronger as a finisher.